News: sportswear brand Nike is reissuing its iconic Zvezdochka trainers designed by Marc Newson, ten years after the shoes were first launched (+ interview + slideshow). The shoes, which Newson described as "revolutionary" in an exclusive interview with Dezeen, were developed with astronauts in mind and named after a dog sent into space by Russia aboard Sputnik 10 in 1961. "I thought it would be really interesting to design a piece of footwear for astronauts or cosmonauts because, in a zero-gravity environment, there was nothing really specific that existed," Newson told Dezeen. The sneakers consist of four interchangeable parts: an injection-moulded outer cage perforated with holes, an interlocking outsole, an inner sleeve and an insole. Newson claims they were one of the first items of footwear to be designed as an industrially manufactured product rather than a garment made by sewing pieces of fabric together. "It was a really revolutionary idea," said Newson. "In terms of the idea of producing a shoe in a mould – like a one-shot, one-piece outer – that was pretty new as a concept." Newson was approached to design the shoes by Nike president and CEO Mark Parker, who himself has a background as a footwear designer. "It's not often when you interact with the head of a company the size of Nike," said Newson. "And he happens to be a particularly creative individual who respects other creative people." Zvezdochka was originally launched in 2004 as a limited edition in five colours. A further edition was issued in 2010. Nike is now reissuing the shoes in the original five colours through selected NikeLab stores and nike.com/nikelab from December 29. Marcus Fairs: Tell us how the project came about. Did Mark Parker approach you personally? Marc Newson: Yes, very early on. I mean we're talking 2000 maybe, something like that. A very long time ago. Mark approached me with a view to collaborating on some level. Obviously the probability of working together on a sort of sneaker concept was pretty high, so that's where we ended up. In fact, when we started, we looked at a variety of different things: we looked at sunglasses, we looked at bags and some other types of footwear as well. But the concept that we went with in the end was the one that you see now. Marcus Fairs: What's the concept behind the shoes? Marc Newson: At that time I had been traveling to Russia quite a lot. I'd been already three times to a place called Baikonur, which is where all of the Russian space launches happen. And the International Space Station had just started – various bits of it had just started being launched. So I thought it would be really interesting to design a piece of footwear for astronauts or cosmonauts because, in a zero-gravity environment, there was nothing really specific that existed. My logic was that there's probably no better place in terms of the necessity to exercise than in a zero-G environment. Marcus Fairs: So there was no special footwear for cosmonauts? What did they wear on their feet? Marc Newson: Well when you're just sort of floating around [in a space station] you wear socks, and when you get onto the treadmill to exercise you wear trainers, because you're running. But I thought the idea of designing something that can perform both functions would be really interesting. Because, you know, sneakers don't have to perform in that environment the same way that they do when they're on Earth - for a whole variety of reasons. But the ergonomy performs in a completely different way. Your foot doesn't need to be supported in the same way. So that's how the concept came about. I knew astronauts and I knew cosmonauts and had actually started doing some work with the Russian space agency on a completely unrelated project. So I'd gotten quite a lot of information about the zero-G environment. And that's where the name came from as well. Zvezdochka is obviously a Russian word, but it's the name of one of the the Russian dogs that went into space [completing one orbit of Earth in March 1961]. Marcus Fairs: What was Mark's reaction when you proposed trainers for astronauts? Marc Newson: He thought the idea was really interesting. It was obviously an ambitious idea – not least for political reasons. I mean NASA don't endorse brands or products, but the Russian Federal Space Agency does. So that was always going to be politically challenging. However, it led to this idea of a convertible shoe where you have sort of like a bootie which transforms into a fully functional shoe by covering it with a kind of sock. It was a slip-on piece. In a way, the whole product was convertible. You could pull the innersole out and everything is held together by friction fit. So there's little glue. And that led to a whole other area of investigation about moulding shoes as opposed to fabricating shoes. Which, you know, back in 2005 was a very original idea. And I think it was one of the very first shoes Nike made that was made in a mould. It was completely injection-moulded. So there was absolutely no fabrication whatsoever. Marcus Fairs: So that was quite innovative for the time? 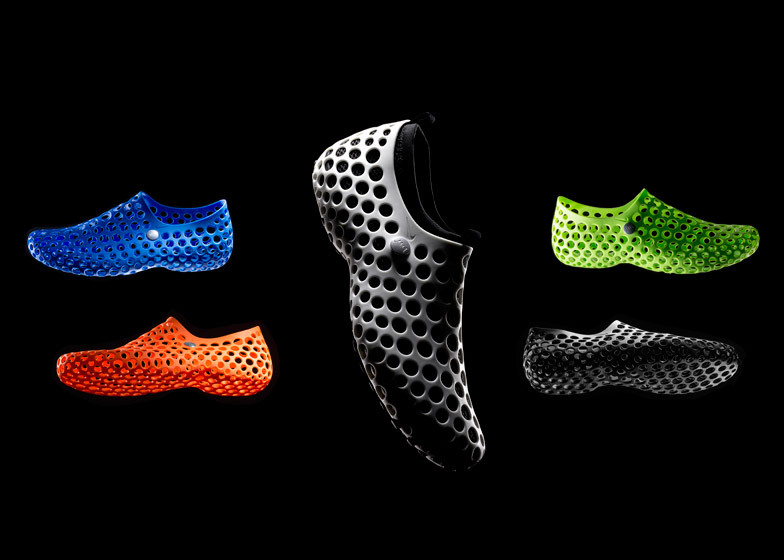 Marc Newson: You know, it was a really revolutionary idea. Marcus Fairs: At that time were there already other trainers on the market that had a separate sock and outer shoe? Was that already happening? Marc Newson: Not to my knowledge. I certainly wasn't aware of anything that functioned in that way – where a sort of bootie transformed into a fully functional shoe. There was certainly nothing by Nike or by any of their competitors. In terms of the idea of producing a shoe in a mould – like a one-shot, one-piece outer – that was pretty new as a concept. Marcus Fairs: The shoes were released as a very limited edition ten years ago. Why were only a very small number produced, rather than putting it out as a global product? Marc Newson: I'm not sure to be honest. That's more of a marketing question that you'd probably have to pose to Nike. I mean, there was certainly some technical issues because this had never been done. The moulds involved were very, very complex to manufacture. Certainly at the time I was aware of some limitations based on the production technology and the fact that it was just very new and no one really could get their head around how it could be. Although it perfectly lent itself to industrial production, it was not very typical. And doing all of the sizings and things like that. It was quite out there. Marcus Fairs: It's now the tenth anniversary of the shoe. How is that going to be celebrated? Nike spokesperson: The idea is to celebrate the ten-year anniversary by bringing back the shoe in the original five colours. It's the exact same shoe reissued and it will come back re-released on December 29th. We will release them through NikeLab. Marcus Fairs: So back to you, Marc. But what's it like working with Mark Parker? Marc Newson: Well I think the situation was unusual and remains very unusual because with Mark, just the simple fact that you talk about him and you refer to him as an individual says it all really. It's not often when you interact with the head of a company the size of Nike. And he happens to be a particularly creative individual who respects other creative people. So in many ways it's like working with a friend. It's like working with someone you have to get on well with that shares similar interests and of course you find yourself talking about things that you have in common. It's very, very easy to collaborate on that level, rather than being given a strict brief. It's a very organic way of working and our relationship over the last decade has remained very organic. We remain friends. We're always happy to see each other and talk. Not necessarily about sneakers or Nike, but just about… stuff. Cool stuff. Marcus Fairs: Have you discussed any other collaborations with Nike? 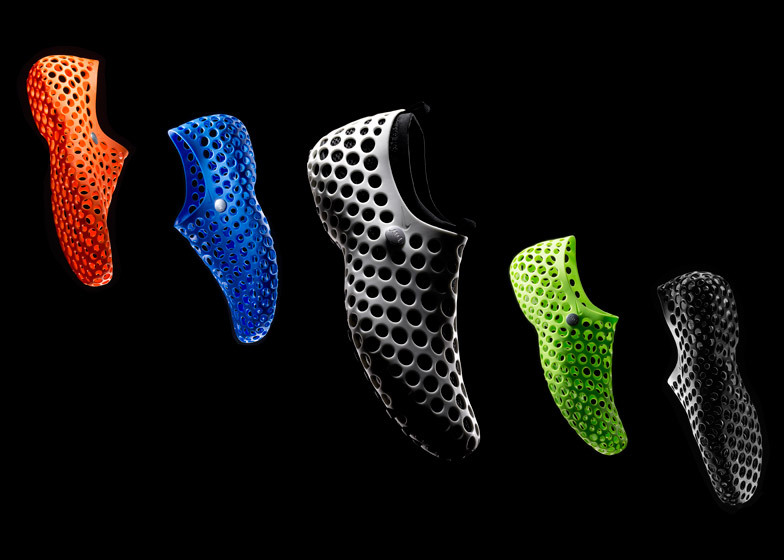 Marc Newson: Yeah, we have over the years. I mean we haven't gotten it together yet, but we've been talking about various things over the years, and it'd be great to be able to do something. I think the feeling is probably mutual. It remains an exciting possibility. The brilliant thing about Nike and working with Mark is that it's always very relaxed. There's never any pressure and there's never any urgency – I mean, obviously, there's urgency when something's put into motion, but, y'know, if it feels right it tends to happen and if it doesn't then it's no big deal. And I make it sound very lackadaisical, but it's one of those sorts of relationship with a client that you'd like to have, rather than the typical situation where you'll be given a brief, work for a client, do the project, finish the project, and then the relationship generally tends to end after the thing's done. Marcus Fairs: Ten years ago the sports footwear market was quite different from now. Back then Zvezdochka was pretty radical, but what's your opinion on how the sector has changed? Marc Newson: It's extraordinary how it's evolved over that period of time. I mean, it was always going to happen. One of the interesting things about Zvezdochka is that I approached it as a piece of industrial design. Not as a garment. Garments are fabricated but products in industrial design are made using truly industrial processes – injection moulding and things like that. And I think one of the big changes is that now you'll find products are much more industrially produced. And I don't mean industrial in terms of quantities. They're using far more intelligent industrially oriented processes in terms of moulding, in terms of materials – things that are just far more technological. It's not just a case of sewing things together any more. There's really, really interesting and innovative technologies being used. Marcus Fairs: Have you been involved in any other footwear projects since then? Marc Newson: Nope. I can safely say! (Laughs) I've always preserved a relationship with Nike, so if it's even going to happen again I think it's going to happen with them. I've never felt the need to go elsewhere and do something with anybody else. I mean I can't imagine a better person to do it with than Nike, so I don't think there's any point. Marcus Fairs: If you were invited by Nike now to do another shoe, what would be the technology that might feed into that? What's the cutting edge of footwear potential now? Marc Newson: I think it's a far more complex environment now for the reasons we've elaborated on. I mean, some of the things that are happening, for example with three-dimensional weaving, exemplified by the Flyknit that Nike is doing. There's some really staggering, interesting things that are happening. It's a far more difficult environment in which to be original. I think the people that are now working in that industry – the people at Nike – are really pushing the boundaries. So it would be farcical for someone like me to come along and... People now are solving problems in that industry in a far more sophisticated way, as is born out by some of the incredible things in the marketplace. Marcus Fairs: You said that these were designed with astronauts in mind, or even for astronauts. Have they been tested in space? Marc Newson: No. The political climate of the time was so toxic – for want of a better word – it was very, very difficult. It would have been difficult for anyone to get these into space. So that was really, if you excuse the pun, the point of departure. It was a starting point, and it spawned a lot of other interesting ideas. And so the whole space reference became incidental towards the end of the project. Marcus Fairs: How do they shape up as Earth-bound footwear? Have you tested them yourself? 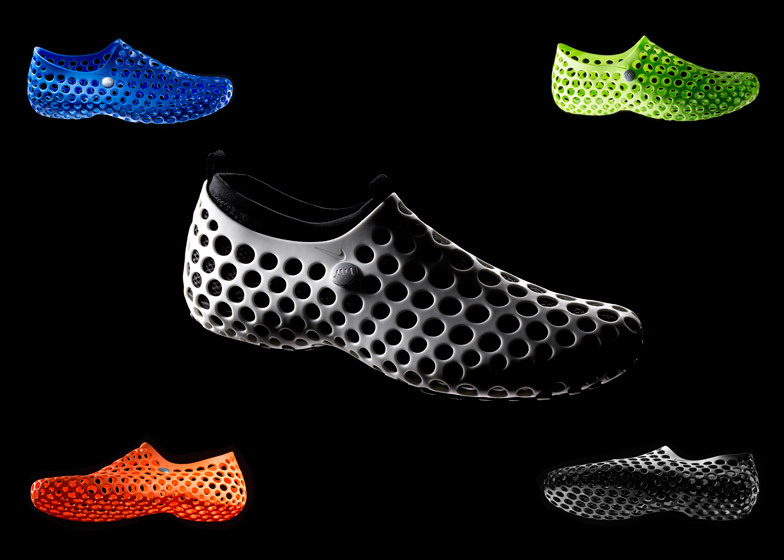 Marc Newson: I could liken them to wearing those sneakers that pretty much hug the sole of your foot but have sort of independent toes. There's this whole sort of genre of sneakers that are like wearing a second skin on your foot, for running on the beach and environments like that. It's a bit like wearing a very robust pair of socks which, at the time, was quite a wacky idea. Marcus Fairs: They become quite iconic very quickly, and I suppose the fact that they're being reissued ten years later is testament to that. What is your feeling looking back on that project? Marc Newson: Well, it's interesting. It's always curious to look back at things ten years later. Ten years is always a really valuable window of time to look back at a project. And it's generally after ten years that you can assess whether or not it's done what it has set out to do, or in fact whether it ended up doing things you never imagined it would do, or whether it's done nothing. In many ways I think the iconic nature of that piece has become evident in a way that I probably didn't anticipate at the time. Of course in some ways it's become dated, but in other ways it feels relevant because, as I was saying before, of the whole philosophy of the way it was produced as a piece of industrial design. It's how I would build an appliance rather than a garment. You know, I'm not that experienced with fabricating things out of pieces of two-dimensional material, but I think that in many ways that particular shoe, without meaning to sound self-congratulatory, has spawned a lot of other interesting concepts out there. You know I keep seeing things even now that look in some ways inspired by that. Who knows whether they were or not. But just the shape – you know, the holes and the alvioli style, with lots of holes... in some ways they're still quite relevant. Marcus Fairs: And they're still trading on eBay I noticed. 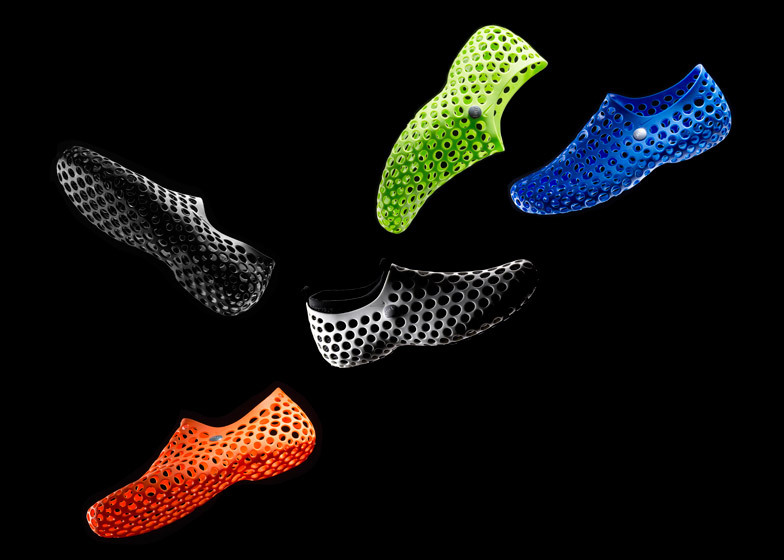 Marc Newson: Yeah, which is interesting, isn't it? Yeah. Crazy. I'm going to start wearing them again, yeah. I mean, I think the simplest way of answering that question is that I won't be embarrassed to put a pair on. And ten years on my daughter will be able to wear some, so that'll be interesting!